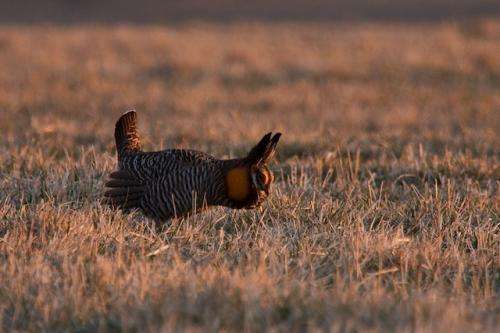 Wind power development does not ruffle the feathers of greater prairie chicken populations, according to the results of a seven-year study from a Kansas State University ecologist and his team. The researchers—led by Brett Sandercock, professor of biology—discovered that wind turbines have little effect on greater prairie chickens, and that these grassland birds are more affected by rangeland management practices and by the availability of native prairie and vegetation cover at nest sites. Unexpectedly, the scientists also found that female survival rates increased after wind turbines were installed. With the arrival of wind energy projects in Kansas and throughout the Plains, Sandercock and his team were part of a consortium of stakeholders—including conservationists, wildlife agencies and wind energy companies—who studied how these wind projects influence grassland birds. "We had a lot of buy-in from stakeholders and we had an effective oversight committee," said Sandercock, who studies grassland birds. "The research will certainly aid with wind power site guidelines and with the development of mitigation strategies to enhance habitat conditions for the greater prairie chicken." The greater prairie chicken was once abundant across the central Plains, but populations have declined because of habitat loss and human development. The chickens now are primarily found in the Great Plains in Kansas—particularly the Smoky Hills and the Flint Hills—where the largest tracts of prairie remain. Sandercock and his team started their study in 2006 with three field sites that were chosen for wind development: a site in the Smoky Hills in north central Kansas, a site in the northern Flint Hills in northeastern Kansas and a site in the southern Flint Hills in southern Kansas. The Smoky Hills site—the Meridian Way Wind Power Facility near Concordia—was developed into a wind energy site, which gave researchers the opportunity to observe greater prairie chickens before, during and after wind turbine construction. The researchers cooperated and collaborated with private landowners at each site. The researchers studied the birds for seven breeding seasons and captured nearly 1,000 total male and female birds around lek sites, which are communal areas where males gather and make calls to attract females. Females mate with the males and then hide nests in tall prairie grass. The scientists researched many different features of prairie chickens and their biology: patterns of nest site selection; reproductive components, such as clutch size, timing of laying eggs and hatchability of eggs; survival rates; and population viability. "We don't have evidence for really strong effects of wind power on prairie chickens or their reproduction," Sandercock said. "We have some evidence for females avoiding the turbines, but the avoidance within the home range doesn't seem to have an impact on nest site selection or nest survival." 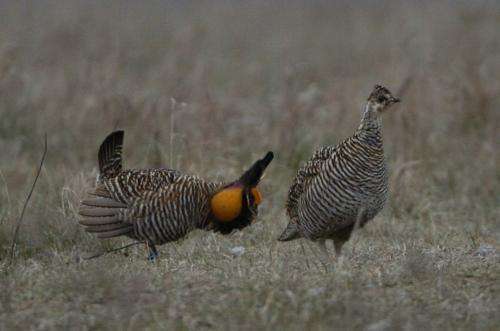 The results are somewhat surprising, especially because similar studies have shown that oil and gas development affect prairie chickens, Sandercock said. With wind power development, the researchers had the unexpected result of female survival rates increasing after wind turbines were installed, potentially because wind turbines may keep predators away from nest sites. Female mortality rates are highest during the breeding season because females are more focused on protecting clutches than avoiding predators, Sandercock said. "What's quite typical for these birds is most of the demographic losses are driven by predation. We can say that with confidence," Sandercock said. "What's a little unclear from our results is whether that increase in female survivorship was due to the effects of wind turbines on predators." The researchers also found that conservation management practices seem to have the strongest effect on the birds, Sandercock said. Prairie chickens are ground-nesting birds and need adequate cover for their nests to survive. Grazing and fire management practices can affect how much nesting cover is available for chickens. "A lot of what drives nest survival is the local conditions around the nest," Sandercock said. "Do they have good nesting cover or not? Our results are important because they suggest ways for mitigation." The team is conducting follow-up studies to test mitigation strategies that may improve habitat conditions for prairie chickens. They are in their third season in a field study of patch burn grazing in Chase County and how it affects prairie chickens and grassland songbirds. Patch-burn grazing involves dividing a pasture into three parts and burning a third of the pasture each year. The practice creates a rotation basis so that each third of a pasture rests for two years. Preliminary data shows that patch-burn grazing seems to provide enough cover for ground-nesting birds, Sandercock said. "Unexpectedly, the scientists also found that female survival rates increased after wind turbines were installed"
"What's a little unclear from our results is whether that increase in female survivorship was due to the effects of wind turbines on predators." Unwanted side effect with Federal blessing for behavior that would put anyone else in jail & bankruptcy court, YES!.. What's the raptor body count at this facility?.